New Hope for Children Orphanage: Girls moving to new home: pray for Pastor George and family! Girls moved into their new home on Sunday. 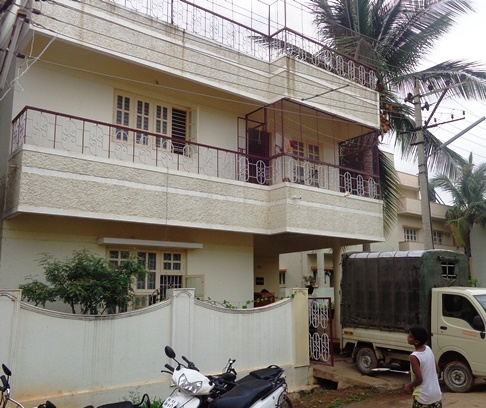 Their new home is a duplex rental unit, that had been the home of Pastor George and his family (you can see George and Jyothi on the balcony in this photo). Please pray for new home for Pastor George and his family! UPDATE, Tuesday, September 17: Beds and other furnishings were purchased for the new girls' home this week. Girls were delighted with the beds... their first! Before, they slept on mats. Pastor George responded to authorities, assuring them that girls now live in home that meets all requirements. As of today, the inspection has not been held... but could be conducted at any time. Please continue to pray for Pastor George and his family: they are still without a home. UPDATE, Monday, September 9: Enjoy these photos of the Bangalore girls as they move into their new orphanage home: Photos of the girls' move. UPDATE, Saturday, September 7: Move of the girls into house formerly rented by Pastor George continues today and tomorrow. Inspectors from government are due to come to the Bangalore orphanage any time now. Please continue to pray that the Lord will bless Pastor George and his family with a new home that is safe, conveniently located, and in God's perfect will. Pastor George and his family are currently staying with Dani and Tyler, volunteers from the USA. This was home of Pastor George and family... and will now be new girls' orphanage home. Please continue to pray for Pastor George and family for a new residence! UPDATE, Friday, September 6: Praise the Lord! More than $10,000 has been raised to relocate the girls' orphanage, and the girls are being moved today to a rental home, which will meet all the new government requirements. With the limited time available and with no other safe and suitable rentals available, Pastor George has decided to move out of his home, and the girls are moving into the home where his family has been living. So now, please pray that Pastor George can find a new home for his family! He and his family and five other children who can no longer live at the orphanage because of their ages (under age 6 or over 18) will be living in temporary quarters until he can find a new place to live. Praise God for Pastor George's heart for the orphan children of India. Lord, we pray Your peace and protection for all of his family! The funds that have been donated will be used for security deposit on the new girls home, for first month's rent, for bunk beds and bedroom furnishings, for kitchen items, and for other required furnishings. If all the funds raised for the relocation project are not necessary for the relocation, any funds not spent will go into a fund to purchase land for building an orphanage home in the Bangalore area. Thank you, Lord, for everyone who prayed and who donated for this project! Donate to save the orphanage and have gift matched! Bangalore’s government has ordered the New Hope for Children Orphanage in Bangalore to shut down if certain demands are not met within the next 10 days. 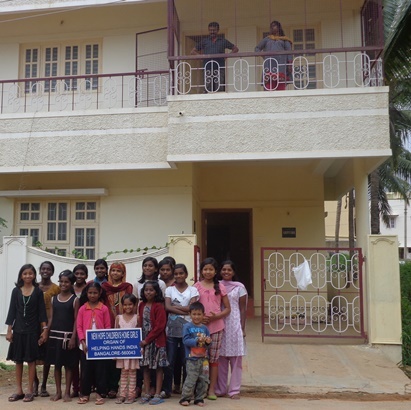 After a recent inspection of the orphanage by the agency governing children’s homes, Pastor George was informed that the orphanage must be closed if he could not immediately provide a larger building (including separate dining area) for the girls living at Bangalore's orphanage. After much prayer and fasting, Pastor George appealed to judges, and the court has allowed until Tuesday, September 10, to find a new home for the girls. First, please pray: That a rental building can be found for the girls in the short period of time available. For many months, Pastor George has been trying to locate a larger facility and location suitable for having the boys’ and girls’ homes adjacent or near each other. When landlords hear that their buildings will be used for housing children, they say "no" or quickly raise the rent to say “no thanks”. Please pray that an immediate temporary solution can be found for the girls until a larger more suitable facility can be found for having the boys’ and girls’ homes near each other. And, please pray: That funds can be raised for the security deposit and startup costs of a separate home for the girls. In India, renters must pay 10 months’ security deposit. So, for example, if a building can be found for $500 per month rent, the security deposit will be $5,000. Other startup costs will include new kitchen and cooking equipment, new type of beds required by regulations (girls currently sleep on mats), and other required furnishings. Estimated total cost for the security deposit and other startup expenses: $9,600. With “man”, the current needs are impossible… however, we know that, with God, all things are possible. Pastor George and the children have been praying and fasting for a miracle! They need our encouragement. If you are praying for Pastor George and the children, can you please send him a brief email to let him know you are praying and to encourage the children? His email: helpinghandsnews@gmail.com . The current needs are great. A gift of any size will be a blessing and encouragement for Pastor George and the children! 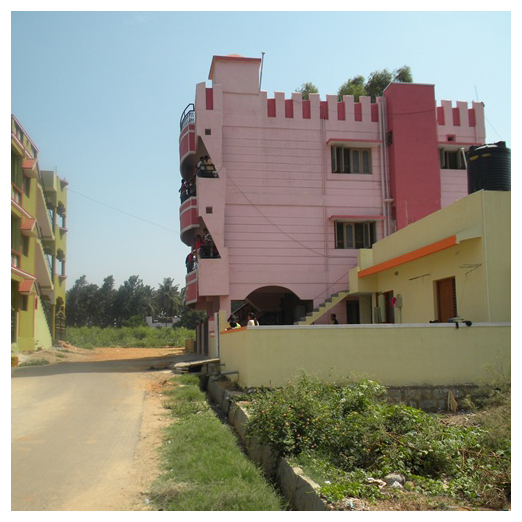 Here's a photo of the current orphanage home at Bangalore. The girls’ home is the smaller yellow building in the foreground. The boys’ home and sleeping quarters are in the larger pink building in the background. The girls currently dine and use one floor of the boys’ building, which is not allowed under regulations passed by India child care agencies in the past year. The longer-term solution to having proper facilities for the orphanage in Bangalore is buying land and building an orphanage. Please pray for God’s guidance, direction, and provision as we consider possibilities for this building project. Thank you so much for your prayers and support for God’s precious children in India! If you have any questions about this current need, please send us an email at info@BigFamilyMinistry.org .